Being an Overseas Filipino Worker is not easy and yet you accept all hardship of it to fulfill their dreams and to achieve success in life. Just to have a better life for themselves and their dreamed for families as they can make far more money being an OFWs. Working as OFWs does not always give full beneficial returns, some are lucky if you found a good employer to work with, but sometimes it’s not always a happy ending. Some even get high compensation jobs, some do not. 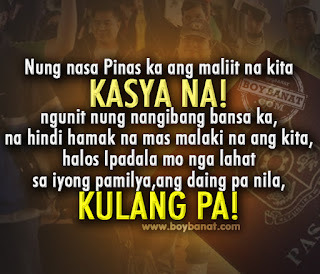 OFWs are heroes in many ways such braved more sacrifices and conflicts in order to give their families a better life. 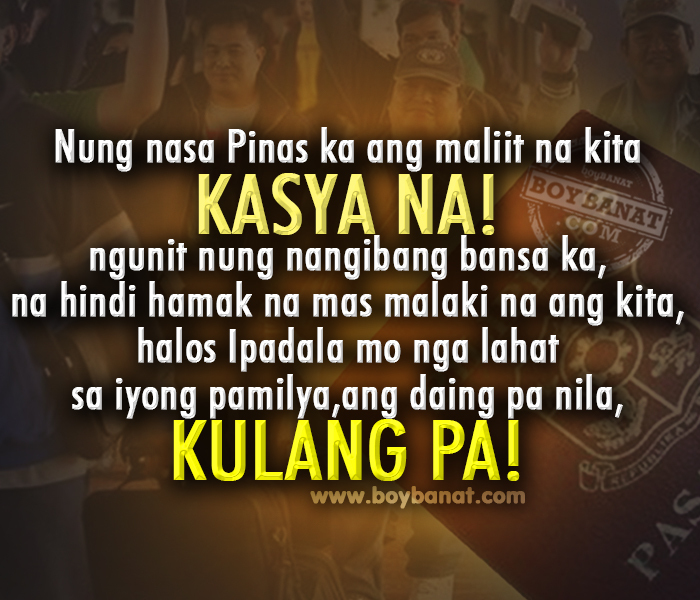 We collected this extensive best, inspirational and latest Tagalog OFW Quotes and Sayings by www.boybanat.com for you and to share with. If you have your own favorite OFW Quotes and Sayings, we would love to hear it, simply add a comment below or just email it to us with a subject: ofw quotes, and will posted up for you. Hope you'll like it! At kahit magkasama tayo sa buong araw. makahingi ka parang may IPINAPATAGO ka! ang maliit na kita, KASYA NA! Ilang taon ka na dyan wala ka pa nagawa? ni di mo naiisip na may matira sayo di ba?